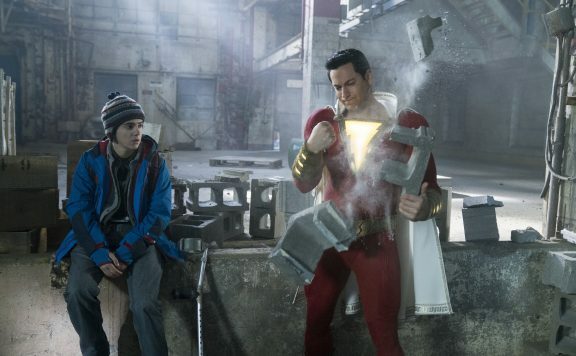 Aaron Neuwirth reviews Shazam!, the big ball of fun that continues to highlight how grand a fun, standalone superhero movie can be, without the grip of a bigger universe around it. It is interesting how integral it feels to discuss the nature of a studio behind a major franchise or cinematic universe these days. DC’s Shazam! is a big ball of fun, witty, and packed with surprises, and yet I feel obligated also to point out that Warner Bros. seems to be on a winning streak as of late. Sure, Justice League was a mixed bag that ended up being more of a salvaged mess than a good movie, but Shazam!, much like Wonder Woman and Aquaman, shows that WB is currently better off working with these standalone superhero tales, which are allowed to be a little weirder and have a stronger impact on those watching them from a variety of different standpoints. The story revolves around orphans and seemingly rejected children. 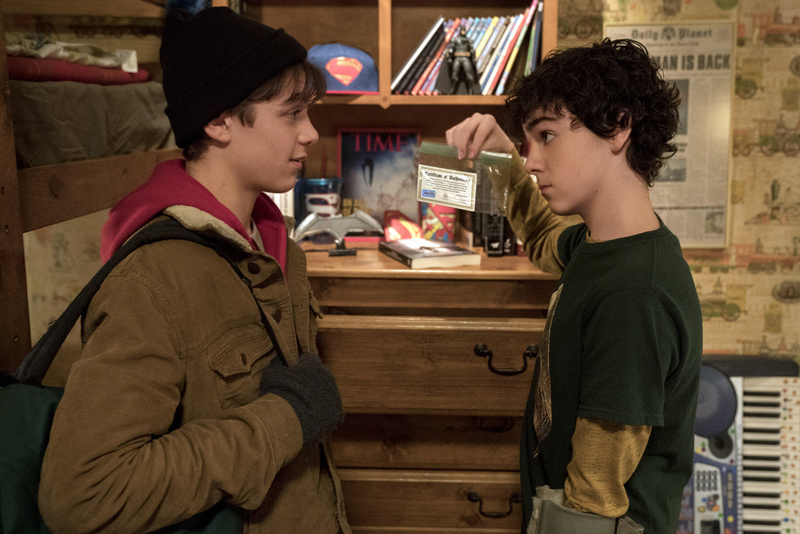 Asher Angel’s Billy Batson is a 14-year-old troublemaker living in Philadelphia, at a new foster home. He’s been on a constant quest to find his lost mother, but arriving in a new living situation means at least trying to be like the other kids. After defending his new foster brother, superhero-obsessed Freddy Freeman (Jack Dylan Grazer), Billy is transported to a mystical cave and granted special powers by an ancient wizard (a hilarious Djimon Hounsou). 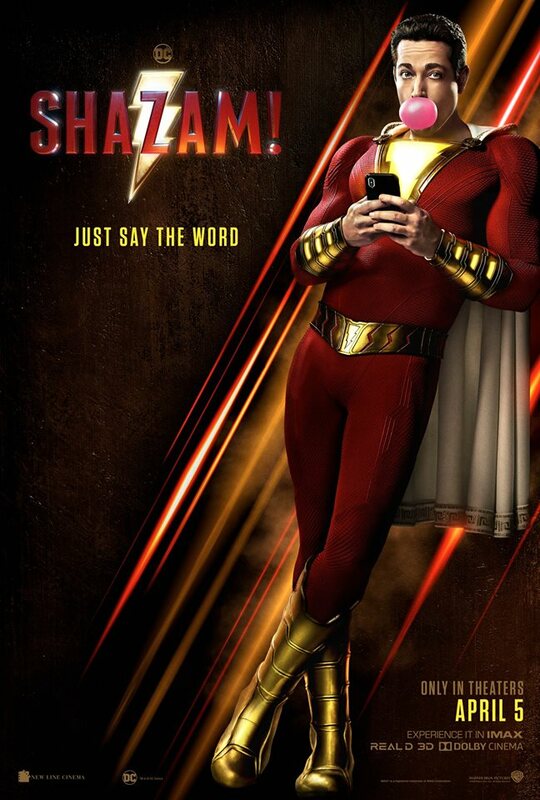 All Billy has to do is say “Shazam,” and he becomes the adult version of himself, complete with super strength, speed, stamina, and other gifts. Of course, understanding and controlling this gift comes with a learning curve. Conceptually, it is easy to see why Shazam! is such a winning story, suited for a superhero movie. We’re watching a standard hero’s journey unfold, combined with the fish-out-of-water element that turned Penny Marshall’s Big into a smash hit in its day (scoring Tom Hanks his first Academy Award nomination in the process). 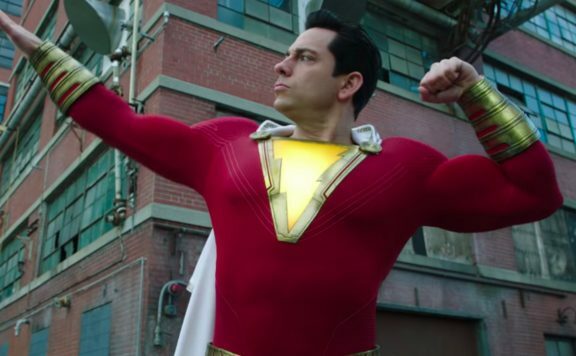 Zachary Levi may not be tripping upwards for Oscar attention as the superpowered version of Billy, but his wide-eyed performance is a big part of the film’s charm as a whole. While Shazam! has its share of heavy moments, complete with dark backstories for both the hero and villain (Mark Strong is always game for this sort of fun), the film ultimately works best as an irreverent comedy. I applaud director David F. Sandberg (Lights Out, Annabelle: Creation aka the best Conjuring spin-off) for treating the younger audience that will view this film with enough respect to not dial down some scary imagery. 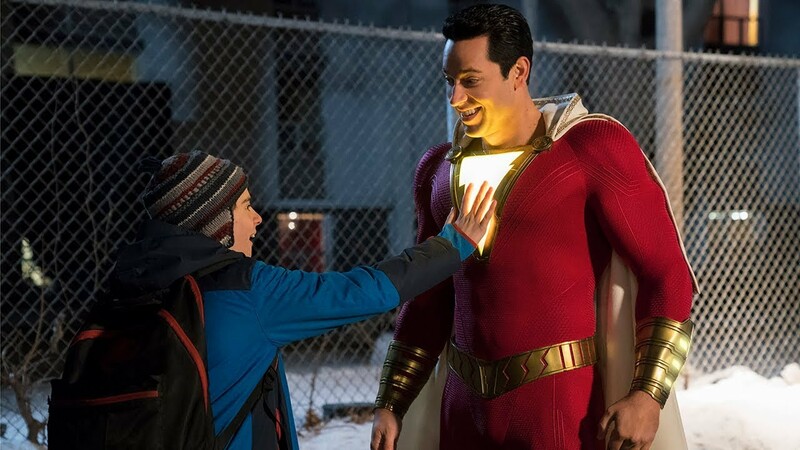 However, he has plenty of fun ramping up the humor when it comes to exploring Shazam’s abilities with Freddy’s help in a manner that calls to mind Sam Raimi’s Spider-Man films. A hilarious montage sequence finds Billy and Freddy doing superhero power tests, which are filmed and happen to turn Billy/Shazam (or Captain Sparkle Fingers) into a viral sensation. Even before these big, trailer-friendly moments, enough is going on in building up this world that we can smile at a more grounded superhero story in the DC universe. It is fun watching the foster family interact, and Strong and Hounsou are both having a ball hamming it up in their respective roles. Still, the film is not above going through the typical motions of a superhero origin story. We see Billy grapple with his newfound responsibility. The evil villain establishes why he’s so evil by way of a vague plan that involves taking over the multi-verse, or whatever. A required amount of bickering happens between friends, helping bring on the inevitable big battles that are strengthened by all of our “good guys” agreeing on what truly matters most. The thing is, Shazam! never stops being fun, nor does it feel like it’s above these plot developments. It’s not the same as the Deadpool movies as far as calling itself out on “lazy writing” as a way to mask its lack of creativity in getting around certain requirements for these sorts of films, entertaining as they may be otherwise. The key that Sandberg and screenwriter Henry Gayden found in bringing this film together is a reliance on character. The comedic and action set pieces work because we care about those who are involved. Even the big climax, which has a lot of moving parts, comes together in some rather ingenious ways because of all the setup that led up to it. 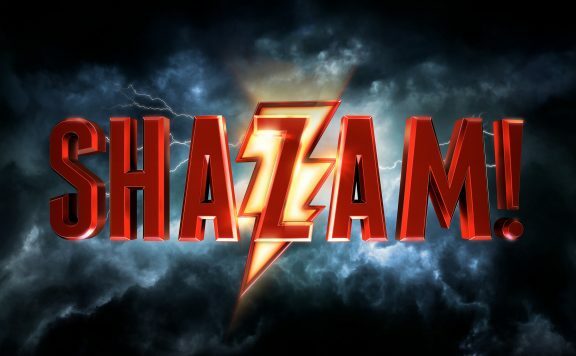 There are also some major surprises, which come based on both my lack of knowledge regarding Shazam, as well as just how good the movie is at keeping our focus. By leaning hard on the central characters involved, we’re willing to follow the film into the wild areas it moves towards, as major reveals take place. Strength in the casting is a big part of why Shazam! can take these chances. The veteran actors do their part, but Levi, Angel, and Grazer are all terrific here. While popping up in a film here and there, this is really the first significant chance for Levi to shine outside of television and he nails the naïve nature of a smart aleck kid suddenly turned into an adult. The same can be said for Angel, who has to brood in a manner that’s not annoying, and be troubled enough to remain relatable, yet not unlikable. Grazer may be the real highlight, however. He’s a geeky motormouth, as well as a disabled young orphan, who has to speak up regularly. Sometimes he is in the wrong, but the sense of wonder you want from seeing cinematic takes on superheroes is in full force here. If anything, Grazer embodies the audience at large, in a lot of ways. With the many ways modern culture both attacks and praises various superhero films, here’s a character who dreams of meeting an actual superhero and has to deal with what that truly means when he does. Working with a smaller budget than the average tentpole, Shazam! can get by on fewer locations and some strong character work (the way this film deals with foster families is especially impressive). That said, there is a lot to admire in how the film adjusts for its spectacle. There are some big CG wizard/monster elements to be seen, along with superpowered heroics on display, and they look and feel pretty great in the moment. There are also some tricks to help subvert audience expectations which go a long way in getting around certain budget limitations. On the whole, having a director with horror roots means having a filmmaker who knows how to work when their back is against the wall. That’s a big key to these standalone DC films, as well, let alone comic book films in general. They have a lot more personality in them than the big team-up movies. With a focus on one central character, a filmmaker seems to have more control over the tone, look, and feel of the film. 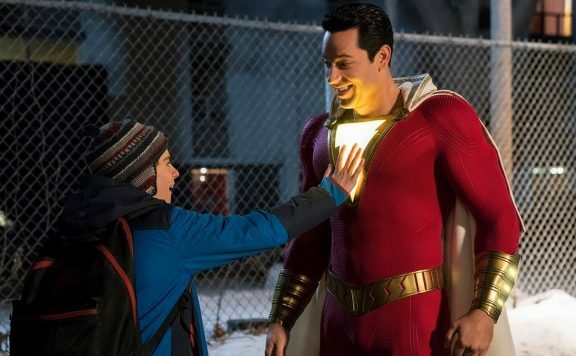 Given where things are right now, I am happier seeing fairly family-friendly Shazam! and an utterly gonzo Aquaman, compared to a compromised Justice League or even a Civil War that feels oddly neutered thanks how it conforms to a house style. That’s not to say there are no merits to watching these well-cast superhero films allowing legendary characters to banter and do things only once dreamed of by comic readers, but seeing the personality of a filmmaker goes a long way in creating a lasting power for these specific versions of these characters through their own films. Shazam! is a lot of fun. It delivers on the enjoyable angle of “what if a kid could suddenly be a superhero” and doesn’t wear out that level of charm. The roles are well cast, creating a believable set of characters who are fun to watch. Enough takes place in this film for audiences to be satisfied by getting what they were looking for, as well as wowed by some of the smart choices and surprises taking place before getting to the end credits. By playing down the shared universe element, I’m happy this latest DC film seems to be under proper control, using the right magic words in its favor. Shazam! Review: Hot Damn, Zachary Levi is Back! 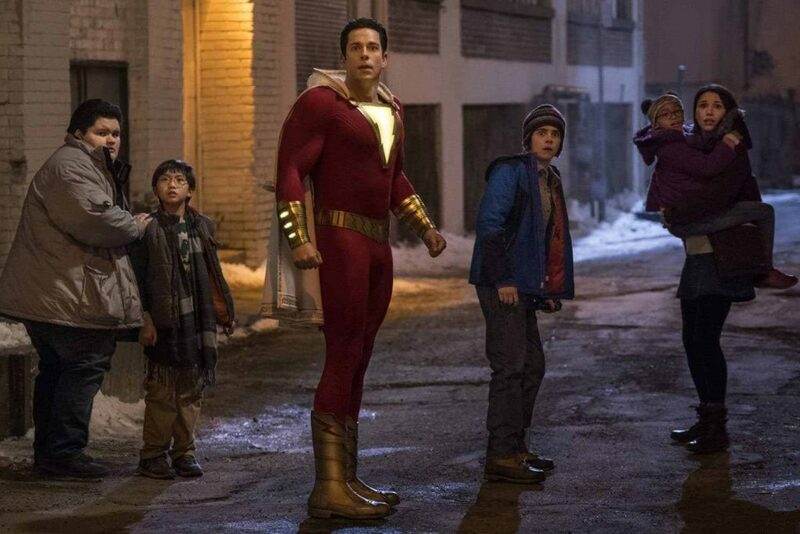 Review: Shazam! is the superhero the world has been waiting for!